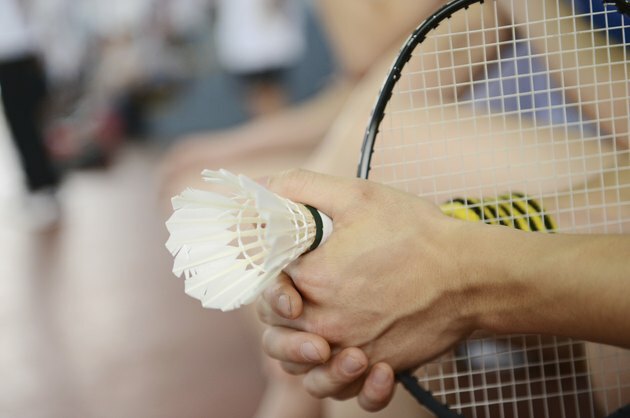 As an international and Olympic sport, badminton has specific rules that govern its play. These rules extend to the equipment used in the badminton. Racket size, court dimensions, net height and shuttle construction are all strictly controlled to provide the most fair and even matches for sanctioned play of the sport. The frame of the badminton racket must consist of a handle attached to a shaft, which connects to the throat and head of the racket. The head must be strung with interwoven synthetic string. The head can be no bigger that 280 mm in length and 220 mm in width. The total length of the racket should be within 680 mm in length and 230 mm total width. The full weight of a strung racket frame must be between 80 and 100 g.
The shuttle, the small object hit back and forth across the net, can be constructed of natural or synthetic material. The ball-shaped base of the shuttle can be made of rubber or cork covered in leather and must be between 25 and 28 mm in diameter. The base holds the skirt of the shuttle to which 16 real or synthetic feathers that project backward and outward are connected. The feathers must be 62 to 70 mm in length. The shuttle must weigh between 4.74 and 5.50 g.
The badminton net can be natural or synthetic. The netting line be fine, dark and of even thickness with a mesh no larger than 20 mm. The dimensions of the net must be 2.5 feet tall and 20 feet wide. A white, folded, 3 inch wide tape must form the top edge of the badminton net with a cord running through the tape to hold the net. The top of the net must be 5 feet from the ground. The posts that hold the net on either side of the court must be 5 feet tall and must stay vertical after stringing the net. The net must tie to the net posts so no gap appears between the net and the post. The outside dimensions of the court must be 20 feet wide by 44 feet long and visibly marked. A center line must divide the court evenly lengthwise. The marked line at the end of the court serves as the singles long service line and a doubles long service line across both sides the court must be marked 2.5 feet closer to the net. A short service line must be marked across both sides of the court, 6.5 feet from the net.